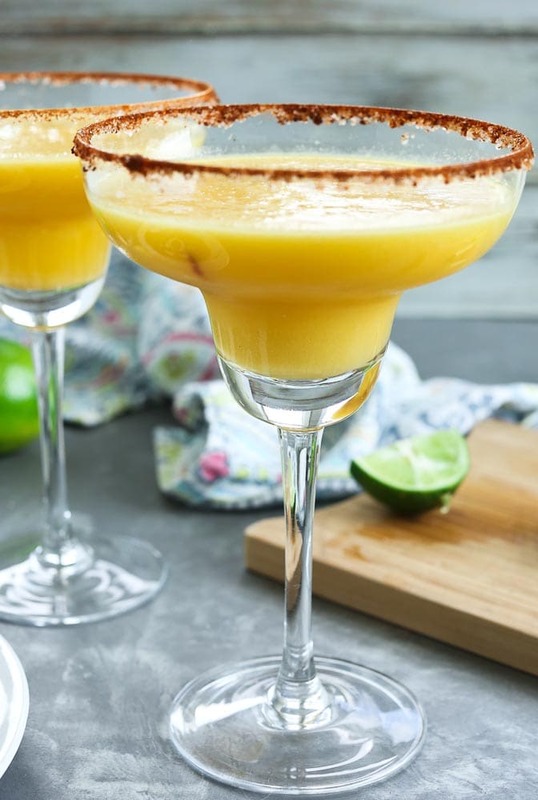 This Mango Margarita Recipe makes a fruity twist on the Classic Margarita and is quick and easy to prepare at home! It’s Friday and Cinco de Mayo; I’d say those are two fine reasons to treat yourself to a Mango Margarita. If you happen to be reading this on a random Monday in another month, well, it’s never a bad day to have a Margarita, is it? My husband is the drink master in this house, so this is his recipe. His recipe for Simply the Best Margarita is my all-time favorite classic Margarita recipe. 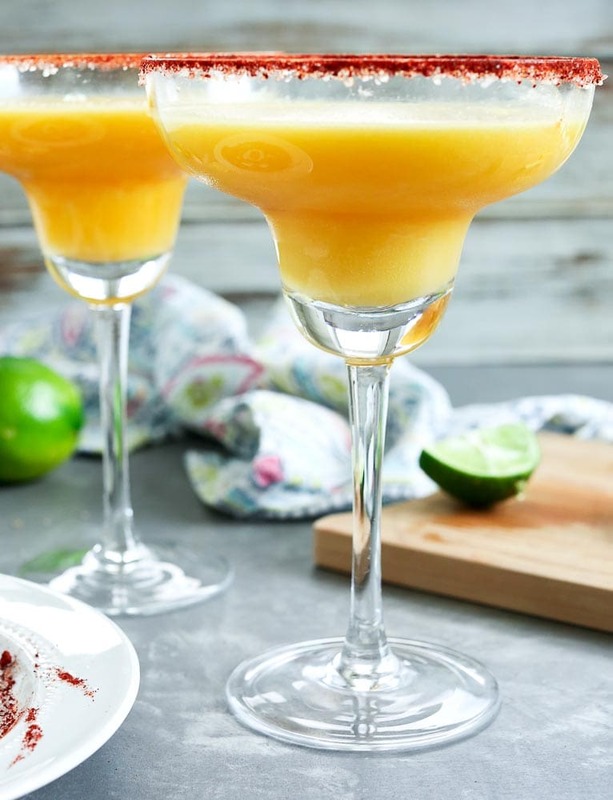 This Mango Margarita recipe is giving that one a run for its money. He developed the recipe, but I added the spicy rim. If you like spicy, it makes a great sweet and spicy combination. If you don’t, you can just add salt like a traditional margarita. One thing you need to know about this Mango Margarita Recipe: it’s not a fu-fu girly drink. I can’t do overly sweet drinks that you can’t taste a bit of alcohol. If that’s your thing, triple the agave nectar and cut the tequila in half. I didn’t actually try that, because then I’d have to waste a drink, but it sounds right. Hopefully you are like me and prefer your drinks to taste like adult drinks and not like kids’ slushies. Also, I typically prefer my margaritas on the rocks. This one, however, is more of a frozen Margarita. This is mostly because I’m lazy and frozen mango chunks are so much easier than dealing with a fresh mango. Nobody wants to deal with a fresh mango on a Friday afternoon, am I right? If all you have is fresh mangos on hand and you aren’t bothered by the process of getting it into chunks, definitely go that route and put this baby on the rocks. You’re a better woman than me. Clearly margaritas are my favorite, since the only two cocktail recipes on my site are for margaritas, but the in-house bartender is up for making more drinks, so send your requests my way. 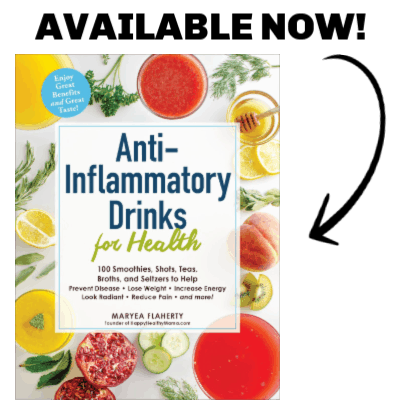 What kind of cocktail recipes would you like to see on Happy Healthy Mama? And no, cocktails are not a contradiction with being a healthy mama. I’ve preached moderation before, right? I’d also argue it helps keep the “happy” in my name. 😉 Enjoy this Margarita! 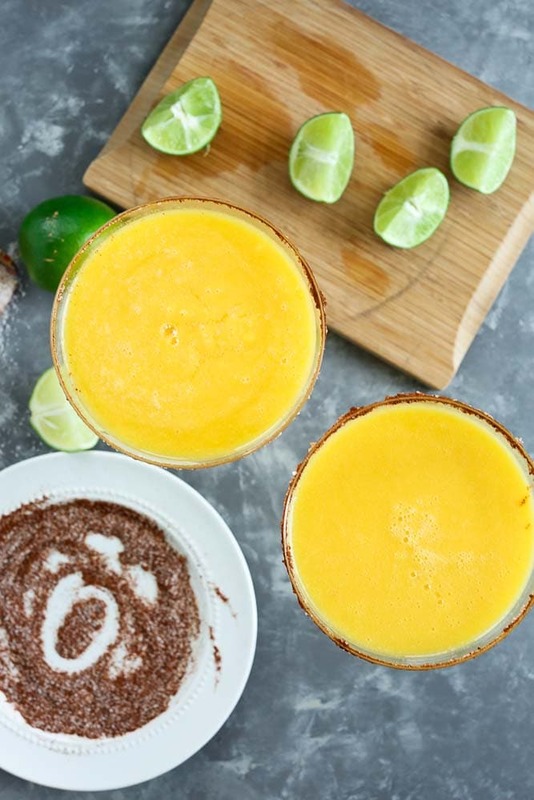 This Mango Margarita Recipe is a fruity, yet not overly sweet, frozen Margarita, with a spicy rim. Mix together the chili powder and salt and place it on a plate. Use a lime slice to wet the rim of the glass with lime juice. Dip the rim of the glass in the chili powder mix. 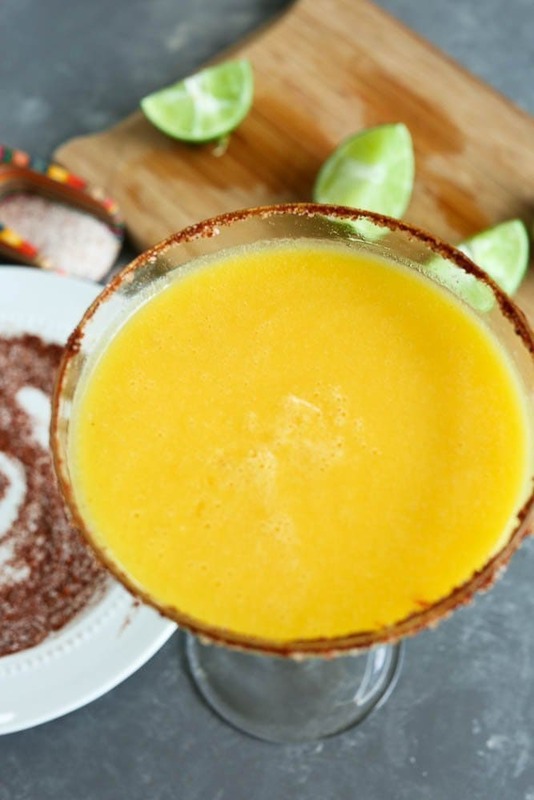 Pour the Mango Margarita into the glass and serve immediately. Enjoy! I tried this out just last night. Loved it! The only thing different I did was using fresh mangos instead of frozen – couldn’t wait for them to freeze 🙂 Next time though! I tried this recipe and it was AMAZING! I think that the measurements are on target and instructions clear. Thank you for sharing! Thanks so much for the rating and feedback, Grace!